Experiencing difficulty breastfeeding can be very difficult for moms. There is so much pressure to be the perfect mother, and it’s easy to worry about what could be causing these issues. Just know that seeking out information and trying to find solutions is a good start, and you are on the right path. Torticollis is a common condition linked to cramping or abnormal positioning in the uterus. This abnormal positioning puts pressure on the sternocleidomastoid muscle (SCM) on one side of the spine, which can cause it to tighten and make turning difficult. If you’ve ever slept in an awkward position, like in a car or on an airplane, and woken up with a sore neck—that’s what wry neck feels like. Basically, it’s contraction of the muscle and restriction or misalignment of the joints of the neck due to awkward positioning. This can happen to children after birth, during birth trauma, or in the uterus. Torticollis causes restricted movement from tension, sending signals of pain to the brain. You may be able to spot signs of torticollis in your baby if they have a head tilt, inability to turn their head completely, trouble breastfeeding, and/or they only look over one of their shoulders. If torticollis goes untreated for months, you may notice flattening on one side of the head. Torticollis can also disrupt a child’s eyes because it causes them to observe their whole world on a tilt and their eyes try to compensate for the misalignment. If you start to notice symptoms of torticollis early on, it’s important to seek treatment, and chiropractic care is a good start. 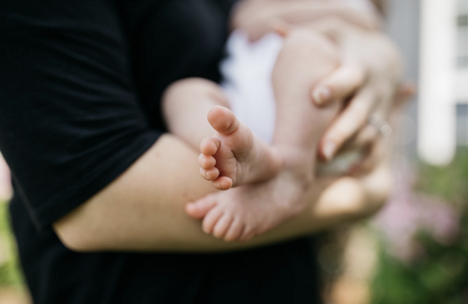 When there are complications with breastfeeding, and an infant or baby comes in for a chiropractic appointment, the nervous system is often the first thing that’s assessed. By checking that the child’s reflexes are intact, we are able to see whether the reason they are not feeding or looking one way may be from a deeper neurological issue. After ruling out issues in the nervous system, often the next step is assessing for muscle tension (especially in the sternocleidomastoid) and then feeling for the joints of the spine. With torticollis I often find the first few portions of the neck are misaligned. Treatment for torticollis is two-part: in-appointment and at-home care. During appointments, misalignment is removed—promoting proper movement, as well as decreasing joint inflammation and irritation. This also helps remove interference to the nervous system which helps with overall health and development. Also, during appointments parents can learn how to safely do stretches with their baby at home. In addition to using the stretches, parents can encourage babies to turn to the side they are having difficulty with at home. When laying your baby down, put the side they are having difficulty turning to towards you (or the excitement in the room). This will encourage them to look in that direction and teach them that it’s ok to look to that side. Also, letting babies lay on their tummies and their side is a great way to aid in the treatment of torticollis. Tummy-time encourages babies to lift their heads, which promotes normal spinal development, strengthens the neck, and helps the digestion system. Stretching out the constricted side of your baby’s neck can be done by laying them on their side. Observe what side your child’s head tilt is to and lay them on the opposite side. This lets gravity stretch out the constricted side. I had a patient whose doctor had noted an issue during the birthing process. When they arrived home and tried breastfeeding, the baby would only breastfeed by turning her head to the right. On top of chiropractic adjustments, coaching with the parents really helped them to promote their daughter turning to the left. While sleeping they positioned her so they were on her left, increased her amount of tummy-time, and did the stretches I taught them during appointments. After consistent weekly visits for a month we got her to start going to her left and spending less time on her right, which has helped prevent any head flattening as a result. If you notice symptoms of torticollis in your baby, contact me to make an appointment today.